Graphene, a two-dimensional wonder-material, has earned immense popularity due to its exceptional capability to conduct electricity. Researchers from the University of Illinois at Chicago (UIC) have used rod-shaped bacteria to add nanoscale ripples in the material, allowing it to conduct electrons differently in perpendicular directions. The bacteria is precisely arranged in an electric field and then vacuum-shrunk below a graphene sheet. The material that is obtained resembles some what like a graphene nano-corduroy and is capable of being used on a silicon chip. The material also has the potential to enhance graphene’s limitless potential in nanotechnology and electronics. The results are featured in ACS Nano. The current across the graphene wrinkles is less than the current along them. Vikas Berry further highlighted that graphene’s great flexibility at the nanometer scale plays a vital role in the formation of these wrinkles, thus enabling the development of carbon nanotubes. “The wrinkle opens a ‘V’ in the electron cloud around each carbon atom,” Berry said, creating a dipole moment, which enables an electronic band gap not present in flat graphene to be opened. Many researchers have developed wrinkles in graphene by elongating the sheet and then allowing it to snap back. 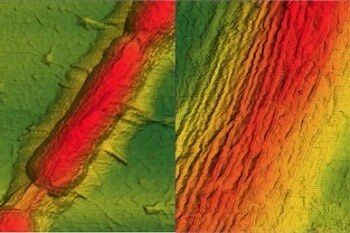 Berry stated that these wrinkles are not restrained in microscale and cannot even be guided towards a particular place on a micro-device. Berry and his team developed a unique method to introduce normal, guided and circumscribed graphene ripples using bacillus bacteria, by using the graphene as a check-valve to adjust the volume of the cells. The bacteria was placed in an electric field, and arranged like strings of hot dogs in recurring rows. A graphene sheet was then placed on top by the researchers. “Under vacuum, the graphene lifts, and lets water out,” Berry said. He also stated that graphene remains on the substrate under pressure and prevents water from entering again into the bacteria. It’s a nanoscopic valve that actuates unidirectional fluid flow in a microorganism. Futuristically, this valve operation could be applied to microfluidic devices where we want flow in one direction but not the other. The graphene reconforms without any wrinkles after the bacteria have been vacuum-shrunk. The permanent ripples on top of the bacteria are arranged longitudinally after heat treatment. These ripples have a wavelength of almost 32 nm and a height ranging from 7 to 10 nanometers. He stated that the next plan is to develop several methods that will help enhance the ripples and adjust their longitudinal length, wavelength and amplitude. Shikai Deng, graduate student and lead author of the paper, measured the impact of the orientation of the ripples on the carrier transport by fabricating a plus-shaped device with bacteria arranged parallel to a single pair of electrodes and perpendicular to each other. He discovered that the conduction barrier of the rippled graphene was greater in the transverse direction than in the longitudinal direction. Berry stated that a totally new material is represented by the introduction of oriented ripples to graphene. Along with carbon nanotubes, graphene and fullerene, this is a new carbon allotrope – a half carbon nanotube linked to graphene. The structure is different, and the fundamental electronic properties are new. The UIC and the National Science Foundation funded the work. In addition to Berry and Deng, co-authors on the ACS Nano study include Behura of the UIC department of chemical engineering; Enlai Gao, Yanlei Wang and Zhiping Xu of Tsinghua University in Beijing; Soumyo Sen and Petr Král of the UIC department of chemistry; and T. S. Sreeprasad of Clemson University.